Until today all the posts in this blog have used a frequentist view of the world. I have a confession to make: I have an ecumenical view of statistics and I do sometimes use Bayesian approaches in data analyses. This is not quite one of those “the truth will set you free” moments, but I’ll show that one could almost painlessly repeat some of the analyses I presented before using MCMC. The first difference is that we have to specify priors for the coefficients that we would like to estimate (by default fixed effects, the overall intercept for our example, start with a zero mean and very large variance: 106). 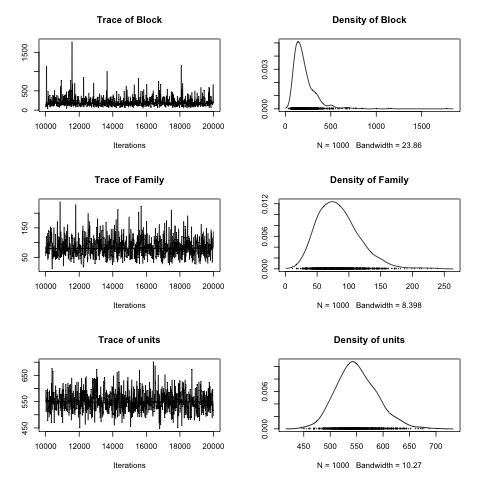 The phenotypic variance for our response is around 780, which I split into equal parts for Block, Family and Residuals. For each random effect we have provided our prior for the variance (V) and a degree of belief on our prior (n). In addition to the model equation, name of the data set and prior information we need to specify things like the number of iterations in the chain (nitt), how many we are discarding for the initial burnin period (burnin), and how many values we are keeping (thin, every ten). Besides the pretty plot of the posterior distributions (see previous figure) they can be summarized using the posterior mode and high probability densities. 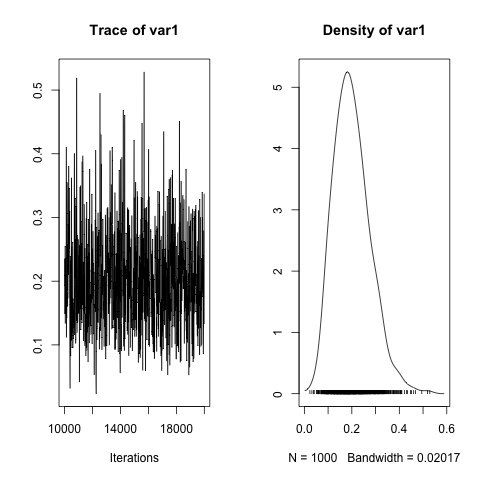 There are some differences on the final results between ASReml-R/lme4 and MCMCglmm; however, the gammas (ratios of variance component/error variance) for the posterior distributions are very similar, and the estimated heritabilities are almost identical (~0.19 vs ~0.21). Overall, MCMCglmm is a very interesting package that covers a lot of ground. It pays to read the reference manual and vignettes, which go into a lot of detail on how to specify different types of models. I will present the MCMCglmm bivariate analyses in another post. P.S. There are several other ways that we could fit this model in R using a Bayesian approach: it is possible to call WinBugs or JAGS (in Linux and OS X) from R, or we could have used INLA. More on this in future posts. Hello ! I stumbled onto your blog since it was recommended on inside-r ! I absolutely love most of the examples that you've provided from the simple to the most complex! Being a newbie to this fascinating world of data mining and stats, I'm trying to get a grasp on Bayesian stats including MCMC and their applications. Is there an online resource you can recommend where I could get some further grounding in this subject ? I'm sure you might get these questions a lot !! But I really do need some guidance !! Thank you. The short answer is I don't know; I've struggled to find something readable (either online or offline). My approach to learning is to grab one of my problems and start there trying to apply the new techniques. I find most material on Bayesian stats very hard to digest and the only book that I've enjoyed reading is Data Analysis Using Regression and Multilevel/Hierarchical Models by Andrew Gelman and Jennifer Hill. The nice thing is that they start with a 'traditional approach' and then they move to Bayesian stats. Thanks very much! I'll definitely give it a go ! It's tough getting access to some of these books which is why I usually tend to leand towards online resources. Hope to see some more posts on Bayesian stats !! Nice post! Does this package handle (well) longitudinal structures? I've done some stuff on Jags/Winbugs myself byt I have been strugling to find good R libraries on longitudinal analysis within the bayesian world. Cheers, Antonio. I think the answer is "some" structures. There are several possible models that could be used for longitudinal analyses (for example, a bit over ten years ago I tried these ones in ASReml—PDF paper 121 KB—in addition to random splines). As far as I know, MCMCglmm can fit only some of those. As soon as I have some free time (ha!) I will expand some examples for MCMCglmm and INLA (another rather cool Bayesian package). At the moment life has been overtaken by marking exams. Finally, I'm quite positive about the progress made by Bayesian packages in R during the last two years, so I expect to see a marked improvement on this area. There is a report on the R-inla website comparing INLA with MCMCglmm for an animal model that I can recommend. See http://www.math.ntnu.no/preprint/statistics/2011/… . Further comparisons on more complex pedigrees might be needed in the future though. It would be nice to have a comparison of the performance forAnimalINLA with other packages such as lme4 and hglm. I had a quick look at that report a couple of months ago and I am running some comparisons for animal models applied to my own data sets (using asreml vs MCMCglmm vs INLA) to see how they fare against each other. I haven't had the time to even explain animal models in this blog but, eventually, I'll get around that. I would also like to point out that classical frequentist and Bayesians are not the only schools of statistics useful for animal models. Classical frequentist inference uses marginal likelihood (random effects integrated out) that includes fixed parameters and only the observations are treated as random. Bayesian inference is a probabilistic framework that combines likelihood and prior information, and treats all parameters and observations as random. A third important school is the one based on the Extended Likelihood Principle. Assuming simple statistical principles Bjørnstad (1996) showed that all information in the data about the random and fixed effects is included in a joint likelihood including three components: fixed parameters, unobserved random effects, and observations as random. Lee and Nelder's (1996) h-likelihood is an implementation of the Extended Likelihood Principle. The hglm package (that I have developed together with colleagues) is based on h-likelihood theory and allows fitting of animal models. We'll get to that! I have to acknowledge that I'm unfamiliar with h-likelihood but, once I'm done with marking, I am hoping to have a look at hglm.